This trip started with me flying to Thailand from Perth on Thursday of last week and then I went to Kathmandu on Friday.We're now in Tibet, and by the time you read this, we'll be at base camp -- we leave early Saturday morning and I can't wait because we're getting closer to the mountain! My group, Altitude Junkies, and I left Kathmandu on Tuesday, crossed the Chinese border and drove a total of about six hours to the Tibetan village of Nyalam, which is 3700m above sea level, where we stayed two nights. It's just unbelievable when you start to get close to the 4000m mark, the land starts to become very bare, you can't see any trees, no fields with any crops. People are very poor in the countryside, but they are very friendly. We went to shops and bought some stuff like lollies and water, and they try to communicate with you but they don't speak much English -- except for really basic stuff like `how much is that' and the numbers up to 10.We came to Tingri on Thursday and it's just like one long street with Tibetan style houses, made of stone, decorated with Buddhist symbols and painted in Buddhist colours of red, white, yellow, blue and green and there are lots of dogs!We've been eating pretty basic food on the way, whatever we could get at the designated restaurants, boiled cabbage, steamed cucumbers, rice, and hard boiled eggs. The drive from Nyalam to Tingri was absolutely spectacular. We were in a valley on a winding road in a bus and on both sides you could see hills which are about 4000m or 5000m high. The scenery is beautiful, even though it is bare and brown, if you like mountains, you're surrounded by them, and in distance you can start to see the high Himalayan peaks. We then went up through a pass that's 5200m above sea level called Thong La, where we stood and took a video, which I'll try to send through later when we have a decent internet connection. We could see the high Himalayan peaks covered with snow, it's just amazing and a 360 degree view. 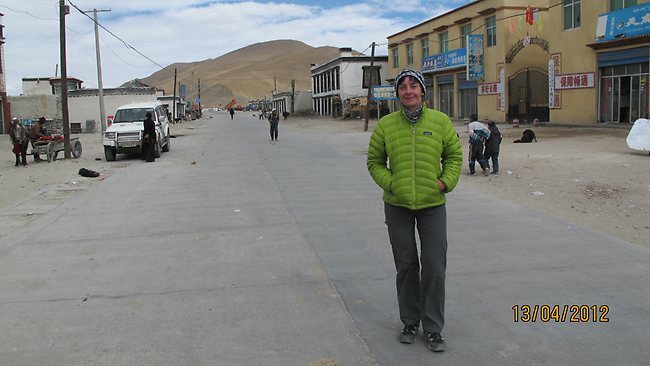 But it was very unpleasant being at that altitude so quickly, but there is just no other way to get to Tingri and base camp. And it was pretty cold, it must be close to zero. When we were just about to enter Tingri we could see the whole north face of Everest, what a treat, it's like a completely different mountain to the south side I climbed last year. I felt so excited, like everybody in the group. We jumped out of the bus and started taking pictures because we know we're going to climb there, we're going to the top, it starts to be more realistic now you can see the mountain. There's more snow on Everest than Phil Crampton, our group leader, remembers on other times, which is fine because that's less rock to walk on -- rock is always very difficult, it's more slippery. Very early Saturday, maybe 5am or 6am Perth time, we're driving to base camp, which is 5200m above sea level. We're going up 900 vertical metres. Phil has warned us that we will feel terrible and he said we will have to just rest and drink water and tea when we get there because hydration is very important. We cannot wait to be at base camp because we'll be closer to Everest and because there's good food and happy hour! NOTE-- Margaret Watroba is an engineer from Perth in Western Australia who is currently climbing Mt Everest for the third time in three years.